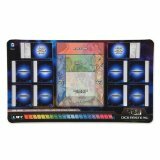 “War of Light” is the second DC Dice Masters release. 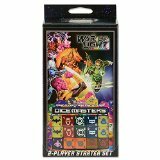 Of all the characters and or sets to add to the second line of DC Dice Masters, the Lantern centric War of Light seems like a bit of an odd choice. Considering what DC properties are hot right now (ie The Flash, Batman, Superman, and Green Arrow), one would think there would be a release revolving around one of those instead. Regardless, there’s no question that the Lantern Corps are a major part of the DC universe and that this set is a worthy addition to the Dice Masters universe. As with any Dice Masters release, it’s best to start off with the Starter Set. The set (which retails anywhere from $14.99-20) contains a new rulebook, 10 action cards, 16 sidekick dice, 12 action dice, 24 character cards, and 16 character dice for the characters Anti-Monitor, Batman, Sinestro, Guy Gardner, Hal Jordan, John Stewart, Kyle Rayner, and Lex Luthor. Also included here are two bags. Yes, they’re still paper, but instead of being merely blue and green, you get nifty new War of Light character images plastered on them. It might not seem like much to some people, but it was a nice touch to me. In terms of the content here, there’s obviously a lot of Lantern characters. As a result, there a lot of Lantern specific abilities which might be seen as a drawback to deck builders. Yes, the Lantern specific cards can be beneficial in creating a Lantern specific deck, but it can be a bit limiting if your opponent does not have any Lantern cards in their deck. For example, say you have the Sinestro: Greatest Lantern of them all card. The text reads “If Sinestro is KO’d, your opponent must KO one of their characters with a Lantern symbol (if able).” If you’re playing against a Lantern deck, this would be a nice bonus, but if you’re not, it has no value. 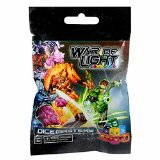 For those looking to dig deeper into the War of Light set, there are the usual $.99 booster packs containing 2 cards and 2 dice. Right off the bat, you will see that there are NUMEROUS factions this time around with the Red Lantern Corps, Green Lantern Corps, Sinestro Corps, Orange Lantern Corps, Blue Lantern Corps, Indigo Tribe, Star Sapphire Corps, Black Lantern Corps, Teen Titans, and Villains. You’ll also notice that some characters released in the previous DC set (such as Wonder Woman, The Flash, Batman, Sinestro, and Lex Luthor) have been included here again, but for the most part, this set is largely filled with new characters such as Parallex, Beast Boy, Kilowog, Mera, Raven, Spectre, Wonder Girl, Mogo, Scarecrow and much more. The most enticing addition, however, has to be the powerful Black Lantern Corps (yes, the zombies) super-rares Aquaman, Batman, Superman, and Wonder Woman. Of the samples I received, I was fortunate enough to receive the Black Lantern Batman. It’s a 9/7 card with text that reads “When fielded, KO all Batman Dice. Whenever a player purchases a non Black Lantern Corps die, that player loses 1 life.” Suffice to say, this is certainly going in one of my decks. Last, but not least players can pick up a War of Light play mat. It is essentially a giant mousepad but it’s a real beauty. It lays out everything that you need to play a full game with including spots for your 8 cards, 20 dice, the 2 action card areas with the dice needed for those, a life counter, and the actual game board with the reserve pool, used pile, field zone, attack zone, KO and prep area. The price ranges anywhere from $14.99-20 which is an absolute bargain. Overall Thoughts: “War of Light” is another solid expansion to an already great game. Up next we have “The Amazing Spider-Man” set which has quite the line-up of hotly anticipated new characters. Look for that one in mid November. Note: Other items available in the line of “War of Light” releases include the Gravity Feed, Collectors Box, and Team Box.